The Center for Integrated Research (CIR) at the Tatoosh School produces scholarship in the heart of the Pacific Coastal Ecoregion. In addition to the research programs of CIR faculty and students, the School’s basecamp provides a logistical hub for primary investigators and their teams to engage in timely and robust research in biology, ecology, rural development, and public lands policy. The Center supports interdisciplinary projects, with an interest in producing sound science to serve as a foundation for decision-makers at local and regional scales. 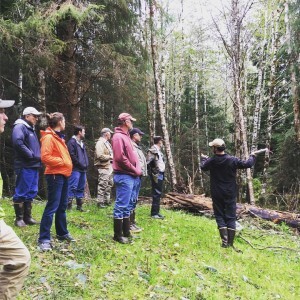 Past projects have included community-based policy development, K-12 forestry curriculum support, and field-based, cross-cultural teacher training. CIR supports long-term watershed restoration effectiveness monitoring across land ownerships in southern Southeast. 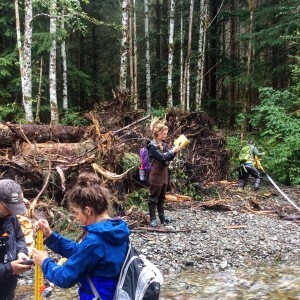 Faculty and investigators leverage curriculum-integrated protocols to track and analyze hydrologic and biophysical response to in-stream and floodplain restoration treatments. Transition, sustainability, and resiliency are necessary policy outcomes in southern Southeast Alaska. CIR supports monitoring to track the flow of benefits to local communities, and analysis to engage questions in public lands policy and rural development. Research includes asset mapping, baseline socioeconomic analysis, and long-term benefits reporting.